My twin sister recently returned from a trip to Kenya, and of all the delicious food she tried and described to me, some familiar and some completely new, the one that stuck with me the most was peanut soup. Maybe it's just because it's been getting colder here, but ever since she mentioned peanut soup I haven't stopped craving it! 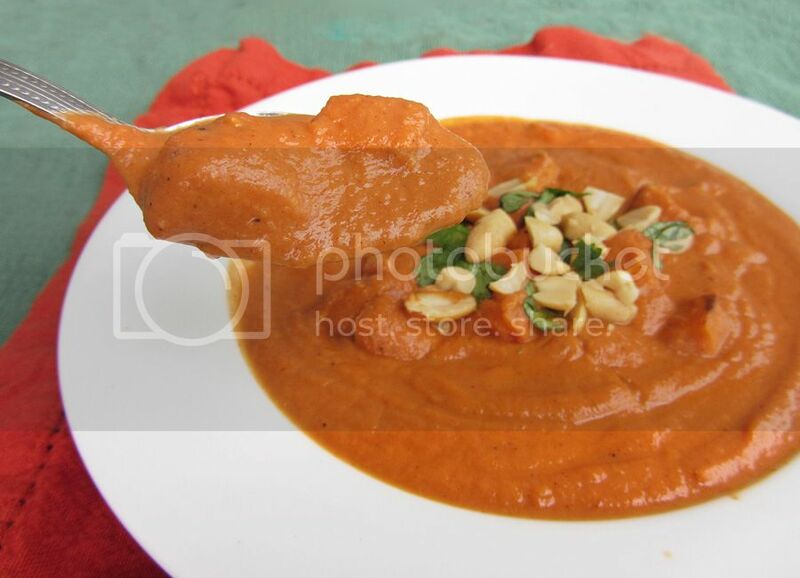 One of the first recipes I came across in my search for peanut soup was this sweet potato peanut bisque from Eating Well. Not only is it inspired by (West) African cuisine, but I also loved that it included sweet potatoes, which Gen had talked about during her trip, as apparently the sweet potatoes in Africa are much better than here! 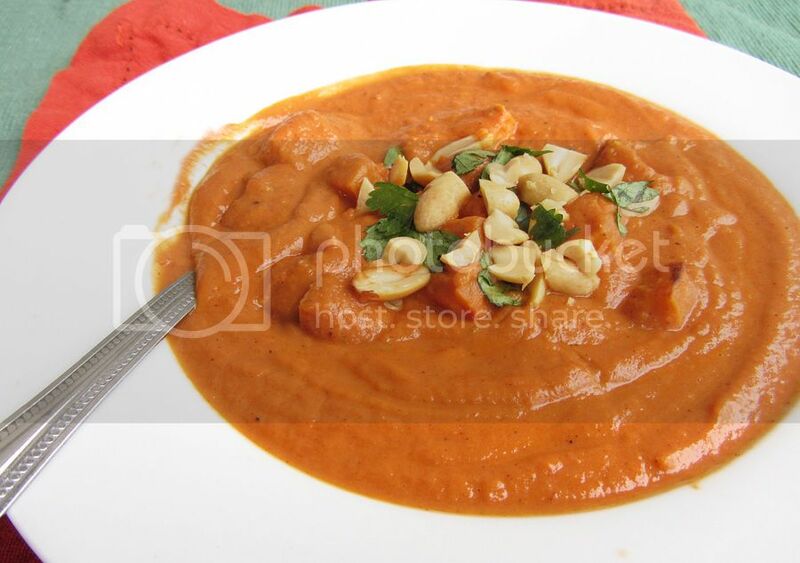 I knew I'd love the recipe because I've already paired sweet potatoes and peanut butter together in two other African inspired recipes that I love: sweet potato and peanut stew and sweet potatoes with West African style peanut sauce. If you're hesitant about the combination of sweet potatoes, tomatoes, and peanut butter, don't be! It works! I absolutely loved this soup and it satisfied my craving for something warm and comforting perfectly! The flavours all worked so well together and the bisque was so thick and creamy while still being healthy. The addition of the green chile made this really spicy, which I liked, but you can definitely cut down the amount of chiles for less spice, or use a dash of cayenne at the end to more easily control the amount of spice you add. While this soup is (supposed to be) more reflective of West African cuisine, if you'd like to read about the food my sister enjoyed in Kenya (in East Africa), along with some cute safari animal pictures, you should check out her blog post about it! Preheat oven to 450°F. Toss chopped sweet potato with 1 tablespoon olive oil, cinnamon, and season with salt and pepper. Spread on a foil-lined baking sheet and roast in preheated oven for 20-30 minutes, until tender. Meanwhile, heat remaining tablespoon of oil in a large saucepan over medium-high heat. Add onions and sauté until softened and beginning to brown, stirring often, about 4-5 minutes. Add garlic, ginger, chiles, and allspice, and cook, stirring, for another 30 seconds to 1 minute. Stir in crushed tomatoes, reduce heat to simmer, and let simmer gently for 10 minutes. Add vegetable stock and peanut butter to the tomato sauce. Transfer half the sauce along with half of the roasted sweet potatoes to a blender and puree until smooth (you don't want to fill the blender too high with hot liquid so blend it in two batches). Puree the remaining half the sauce, then pour all the puree back into the saucepan to heat. Add the remaining half of the sweet potatoes to the soup and cook over low heat until heated through. Season to taste with salt and pepper. Serve and garnish with chopped cilantro and peanuts. Amazing! I went to Kenya and Uganda a few years ago and this takes me back! Thank you for sharing such a delicious recipe (and one I plan on making right away!) I hope you are having a beautiful week! Okay, we definitely have similar taste buds because I'm pretty sure I've made this recipe too! :D I have a subscription to Eating Well and I know I've made a sweet potato & peanut soup, so I'm guessing this is where it came from. So funny! And now this post is reminding me that I need to make it again. I love a nice filling soup for fall! 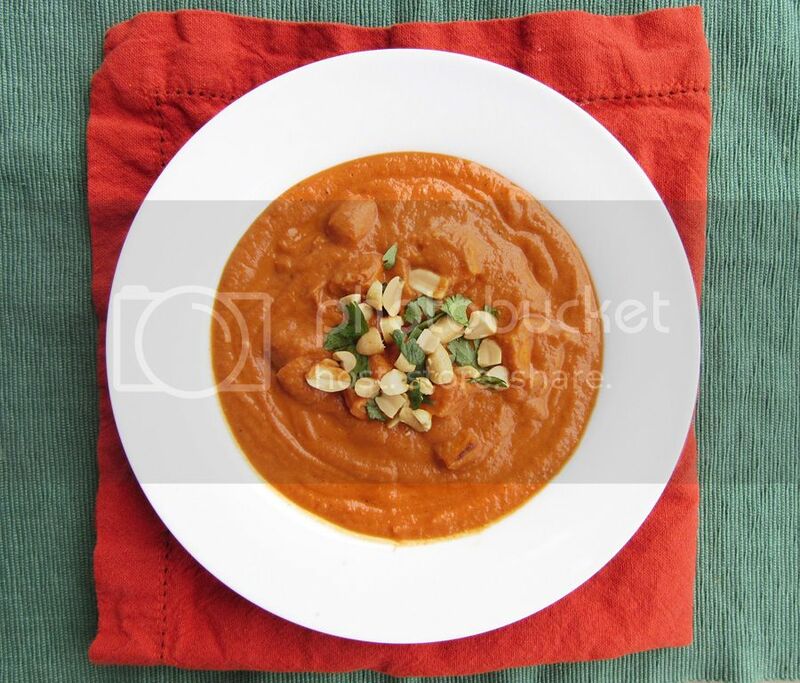 Such an interesting flavour combo, and I just love the colour sweet potatoes give to soup! I hope you do, and share with me! Thanks Monet! Wow, Kenya and Uganda - that must have been quite the trip! This soup is definitely inexpensive to make and I think it tastes just as good as something you could get in a restaurant! Haha too funny - yes I'm definitely drawn to anything with peanut butter in it! I know, I loved the colour of this! I am all for the sweet potato/peanut combo! I'm thinking this needs to be made. This week. i've made a very similar soup to this, but added light coconut milk, which was a lovely addition! I am on a one month road trip / trip to mexico and we started 2 days ago. I am already on cooking withdrawl! This doesn't help. I love peanuts. I love sweet potato. It looks beautiful! That would be such a great addition! Thanks for the idea! Wow, have a great trip! I'm sure you'll be trying lots of other great food! This was very thick. I ended up adding an extra cup or more of stock to thin it after blending. Good flavor -- tastes very rich.